Is there a “submerged object” in Australia that causes a magnetic deviation of 20 degrees? Basalt formation, “Mt. 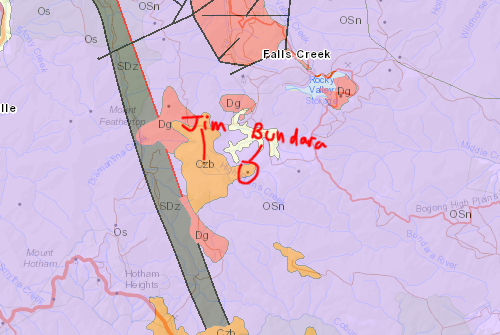 Jim”, in remote north-east Victoria, Australia, has a magnetic anomaly -20 degree magnetic compass variation - caused by a massive, yet unknown, submerged object. Is there really a verified magnetic anomaly in north-east Victoria, Australia of 20 degrees? If so, is there a naturally occurring phenomenon (e.g. large sub-surface ferromagnetic rock formation) that causes it? A link to some deviation map or other verifying, quantitative source is requested, thanks! I'll disagree with Camilo Rada's answer, and show that there is definitely a magnetic anomaly. 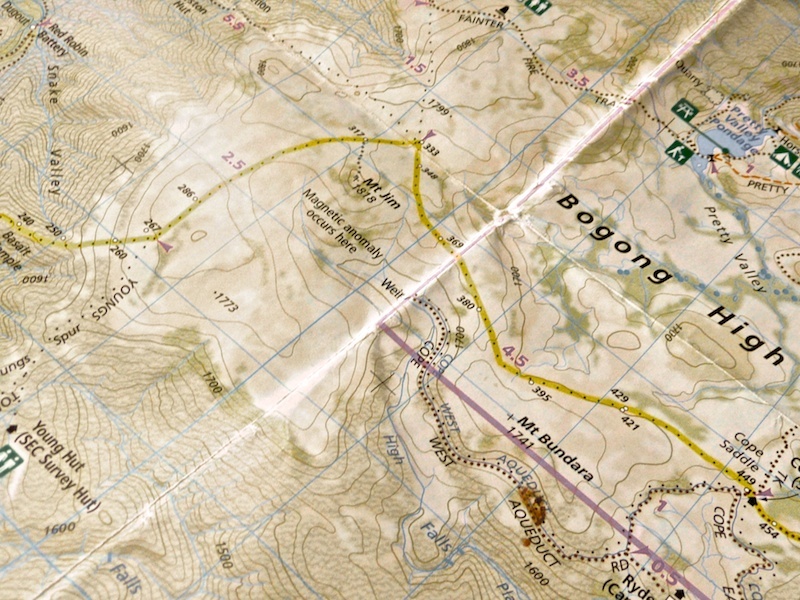 You can see a clear magnetic anomaly in this area, and it's actually much more widespread than noted on your map. If so, is there a naturally occurring phenomenon…that causes it? Overall, the rock type around is "OSn" and "Os". According to the legend, these are high grade metamorphic Ordovician and Silurian rocks, and neighbouring rocks are siliclastic which tells me they shouldn't be too magnetic (confirmed by the magnetic map). 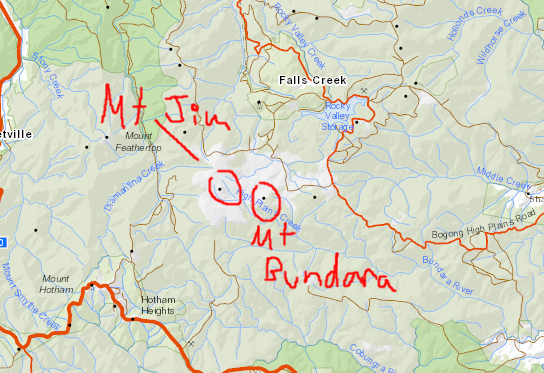 The area of Mt Jim has "Dg" (= Devonian granites) which might be slightly magnetic. But here's the thing you were looking for: "Czb", which is short for Cenozoic basalt. And basalts are magnetic. 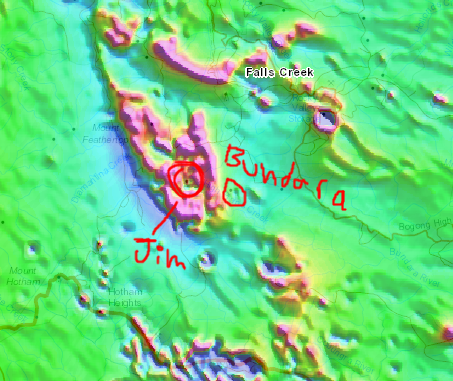 So to answer your question, the source for the magnetic anomaly isn't a "submerged" (buried would more appropriate here btw), but a basalt fully exposed on the surface. Interestingly, the blog post mentions the presence of basalt, so it's not entirely clear why they claim that there's a "massive, yet unknown, submerged object". Most probably there's simply more basalt, or its intrusive analogue: dolerite or gabbro. These targets are attractive for the mining industries. I would be surprised if it hasn't been drilled at some point by an exploration company, and then the underground cause of the anomaly would be very well known (but probably not publicly). The Mount Jim in your map seem to be the one located at 36° 55' 17" S and 147° 13' 01" E. Although, magnetic anomalies are not mapped over the whole worlds, the World Digital Magnetic Anomaly Map provides the best compilation, and there is good data around your area of interest. As you can see, it doesn't seem to be any specially significant anomaly around Mt. Jim. However, this data show the magnetic anomaly reduced at 5 km of elevation. Therefore, a very strong but localized anomaly might not show up here. One other thing that is estrange in your reference, is that a magnetic anomaly would not produce a consistent "-20 degree magnetic compass variation". Instead, the magnitude and direction of the variation would strongly depend on how close and where are you relative to the anomaly. Not the answer you're looking for? Browse other questions tagged geology geophysics geomagnetism rock-magnetism or ask your own question. What causes the Earth to have magnetic poles? Why Earth's magnetic poles are (and were) in their positions? A faster way to measure the rock magnetic S-ratio? How probable is is that earth magnetic field will change 180 degrees at once? Is there a high-temperature, non-magnetic glue that doesn't dissolve in water?